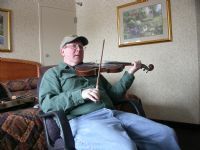 You must sign into your myHangout account in order to contact Midwest_Fiddler. i love that AEAE tone. Makes me want to get back to the woodshed. I was glad to see this tune posted here! Ron wants to do this tune with Loose Change. Well, when I try to learn a tune from a banjo player I'm never sure I'm doing what I should be doing melody-wise. (Turns out I wasn't too far off when we went through it today. Nonetheless I'm glad for a good fiddle version. Really nice! Love those old modal pentatonic tunes. Well played!